Recently, an ultra-robust biomimetic architecture has been developed. 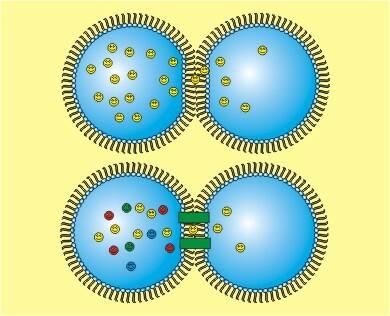 Droplets immersed in an oil/lipid mixture become encased in a lipid monolayer. When two such droplets are contacted, a droplet-interface bilayer (DIB) is formed; many connected droplets comprise a bionetwork. By incorporating membrane proteins such as ion channels and pumps into DIBs, bionetworks can be engineered to carry out specific functions. We aim to create stimulus responsive bionetworks in order to model electrically driven systems such as heart and nerve tissues. 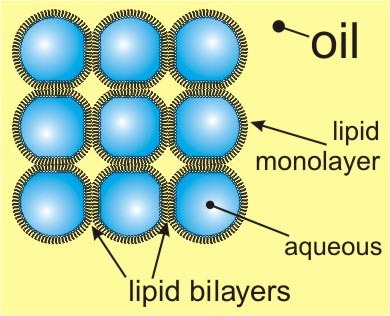 A lipid bilayer is formed when two droplets submerged under an oil/lipid mixture are brought into contact. Here, the droplets are hung from agarose-tipped electrodes that are connected to manipulators. Bilayers can be formed and pulled apart repeatedly. After DIB formation, the area of the bilayer can be controlled by changing the distance between the electrodes. Rather than using electrodes, here droplets are arranged on a surface patterned with micromachined divots. As the droplets settle into their dimples, bilayers are formed. The bilayers between the droplets are incredibly tough. Here, a droplet surrounded by 4 bilayers is extracted by plunging into it with a gel-coated electrode. When the electrode is lifted, the droplet is pulled out - without disturbing the surrounding DIBs. Here, a droplet incorporates into the bionetwork to replace the droplet removed in Movie 3. The trafficking of molecules across cell membranes is of central interest in metabolism and disease. Assays of membrane transport using live cells are performed under stringent conditions in order to maintain cell viability. Using arrays of DIBs, we study the transport of molecules from one droplet to another, maintaining the conservation of mass throughout the assay. Both passive transport (diffusion of molecules across the bilayer) and active transport (membrane transporters using energy to drive transport) are investigated. The incorporation of functional ion channels into artificially formed lipid bilayers is a challenging task. Many species of ion channel are delicate and quickly denature or otherwise lose activity when purified from their native systems. 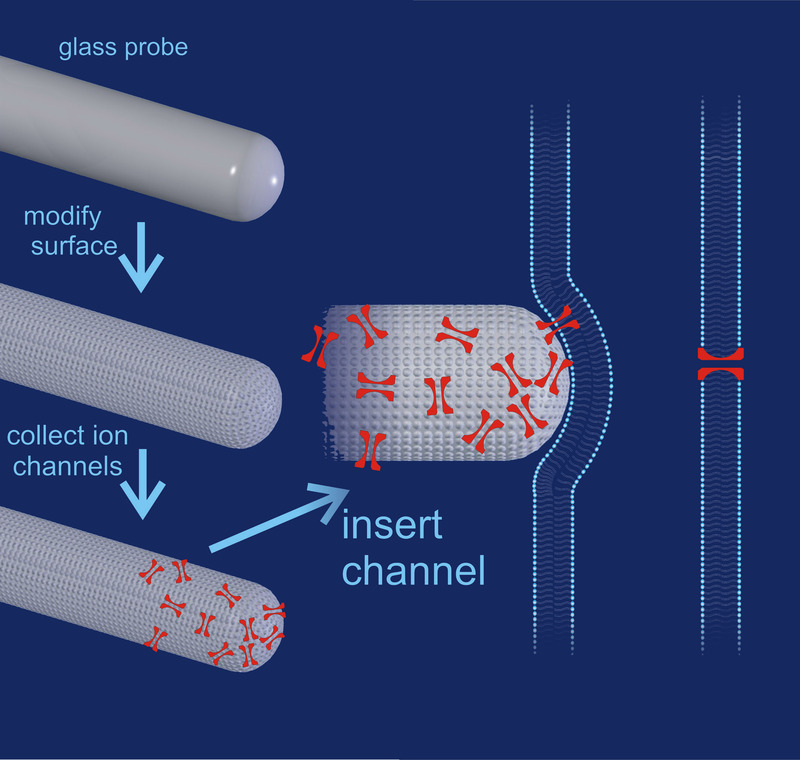 Using a mechanical probe, we transfer membrane proteins (such as ion channels) directly from cellular systems to preformed bilayers for single-channel investigation by electrophysiology. Automation of the transfer technique represents a key advance in the study of ion channels. Copyright © 2014 Holden Research Group. All rights reserved.